join us for a night exploring the shared language of music and…cocktails! Our upcoming residency at The Shed, NYC’s hottest new performance space, continues our commitment to bold new works. We’re kicking off this groundbreaking exploration with an extraordinary party at a historic Prospect Park mansion. Join us for an evening of exciting cocktails, adventurous music, and delicious home-cooked food to celebrate the launch of this new partnership and our continued commitment to fostering the unexpected. Will you join us in supporting the radical works of tomorrow? One ticket to the Ensemble's 4:30pm show on April 28th at The Shed. 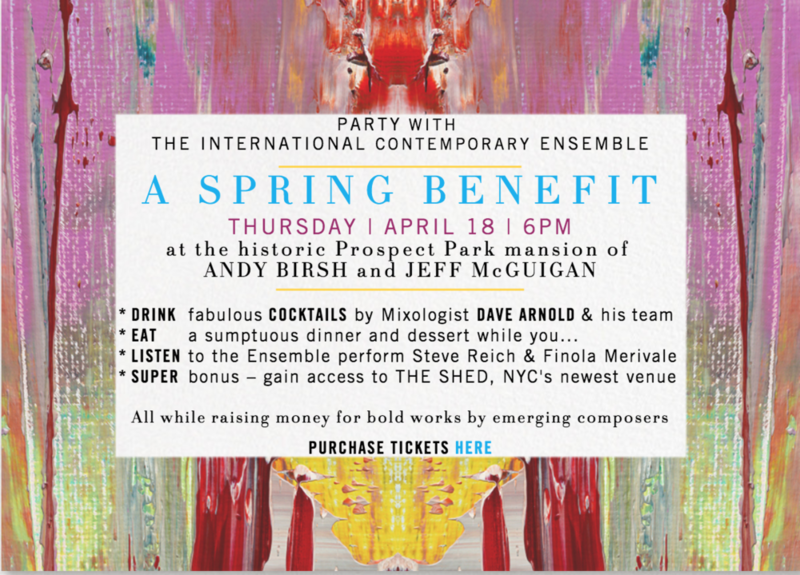 From April 23rd to May 12th, the Ensemble will perform the World Premiere of an immersive work conceived by composer Steve Reich and painter Gerhard Richter to celebrate the opening of the newest cultural center in New York City, The Shed. The Reich/Richter pairing examines the intersection between Richter’s formula for his “Patterns” series and Reich’s rigorous, repeating musical structures. All but $50 of your donation per ticket is tax-deductible to the fullest extent of the law. Recommended attire for the event is Creative Attire. If you are not able to attend but would still like to support the Ensemble, you may make a 100% tax-deductible donation here.